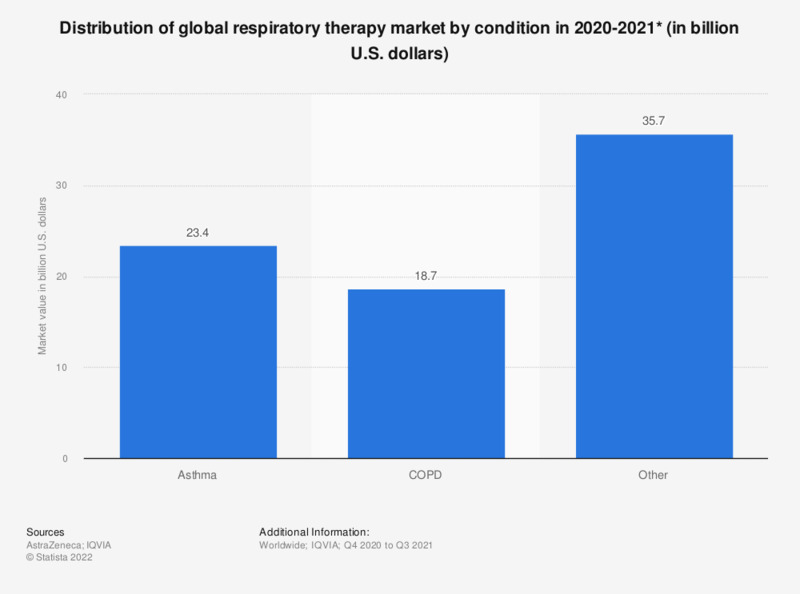 This statistic displays the global respiratory therapy market by condition based on the MAT (moving annual total) until the third quarter of 2018 (October 2017 to September 2018). In that year, the global asthma therapy market generated 20.5 billion U.S. dollars. Asthma is a major cause of morbidity and mortality globally and it is thought to have become more prevalent in the last decades. Fixed combination doses of preventative and symptomatic treatments are used to combat moderate to severe asthma. * MAT (moving annual total) 3rd quarter 2018. Everything On "Pharmaceutical brands: Advair/Seretide (GlaxoSmithKline)" in One Document: Edited and Divided into Handy Chapters. Including Detailed References. Statistics on "Pharmaceutical brands: Advair/Seretide (GlaxoSmithKline)"